I've just come back from an intimate gathering with His Holiness the Dalai Lama and 14,499 of my closest friends. If you've been playing along at home you'll know I'm not a religious person, but I am one of those annoying people who consider themeslves a 'Lifestyle Buddhist' - I may not believe in the mystic side of the religion, but I appreciate the morals they teach and try to live by them. Security was tight; all bags were searched and every single person was 'wanded'. It was similar to going to the airport in that you couldn't take in drinks, the food was overpriced and undercooked, my ears popped (the venue was pressurized) and there was a lot of waiting around in rather uncomfortable seats. In fact when we left I half expected to walk out the door to a different city. No such luck... I'm still in Dullsville. The conditions of entry on the ticket prohibited "video or audio recorders of any type" which I took to mean mobile phones... apparently I'm the only one who thought that because looking around, I was the only person there not taking photos with a phone. 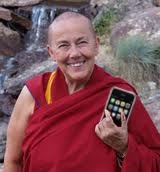 Even a Buddhist Nun was walking along talking on her iPhone. Yeah. Ponder that for a moment. The crowd was full of doppelgangers, it was amazing; There was Map Guy aged 45, Jesus (complete with white robes and sandals), one of the chicks from the Waifs, Kurt Cobain and a girl in front of us who looked like a shorter version of Miranda Kerr and had His Holiness' book, 'The Many Ways to Nirvana', in her hand bag. All around me people were being enlightened and all I can think is that Miranda should give her book to Kurt and he could wave it away with a laugh, saying "I don't need to find it, babe, I created it." When he said he loved his friend George Bush but didn't agree with some of his policies; that stuck out in a "Did he just say he loved George Bush?" kinda way. When he said we should live spiritually but have secular ethics; that stuck out in a "OMG a religious leader not being preachy preachy" kinda way. When he said he liked how the Maori people integrated to the 21st century but kept their language even though he wasn't sure if it was a sophisticated language; that stuck out in a "Dude that's a bit racist" kinda way. But the message I took away from the morning was one of love and compassion. When we have compassion for each other, when we truly strive for what is best for the world in the long run by forgoing some of our needs in the short run, and when we can forgive those who have done us wrong and remember to love the sinner not the sin, we can find happiness. Obviously not everyone took the message of compassion on board because waiting for the shuttle back to the carpark someone tried to cut in front of us in the line. Nice. What do you do to find happiness? Can you differentiate between the sin and the sinner? YES! That bit was so funny!!!! Forgive the sinner, not the sin is simple and cannot be easily forgotten. Ohhh but it is hard. Glad you go something out of it. Was it almost like Satan's party on Southpark when 'everyone' was there? Still having trouble getting past the fact he has a twitter account... Does the pope have a twitter account? It must have been a very cool and surreal experience! Loving the sinner but not the sin sounds like it'd be worth a try!